“Pot of beans” usually meant white navy or limas. My adult longing for beans also extends to the exotic, like flageolets or borlottis. Years ago a trek to a fancy market selling unusual goods yielded such beans, but these days I can roll on down to my favorite neighborhood market Little House Green Grocery for a bean fix. 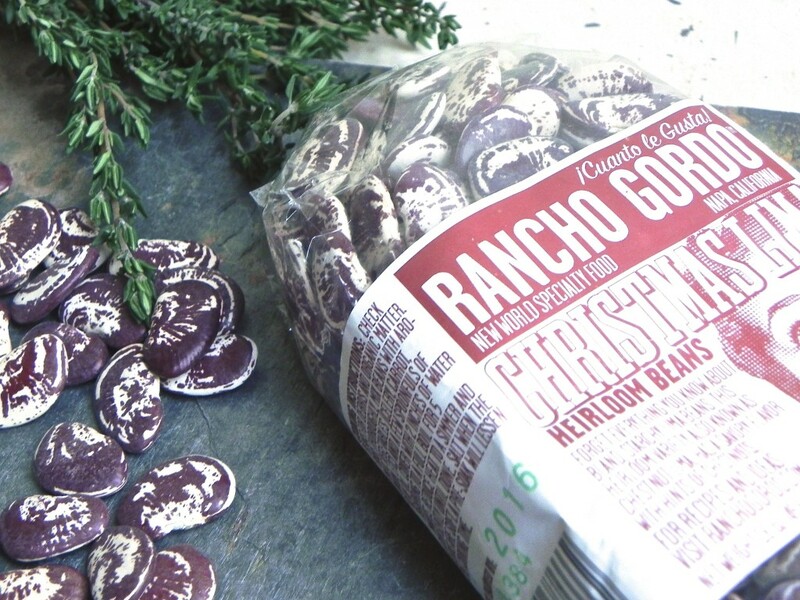 Proprietors Jessica Goldberg and Erin Wright sell selections from Rancho Gordo‘s line of heirloom beans. The company, based in Napa, California, keeps these precious beans in circulation so that we can enjoy old fashioned beans grown in a responsible manner. Canned beans are good for a quick fix, but the extra time you spend making bean soup from scratch will convert you and whomever you are serving. The easiest method for preparation is to soak the beans overnight with fresh water to cover. You can also bring the beans to boil, with water to cover, and let them soak off the heat for an hour, draining and then proceeding with the recipe. I use this method if I simply cannot wait another day for my beans, but for today’s bean soup I practiced patience, patience, patience. The brilliant color pattern of these Christmas Limas (shown in the picture at right) will be lost during cooking, and something else entirely will be ladled into your soup bowl, richly dark and just as beguiling. The amount of fresh thyme for the soup will, with slow cooking, give up a subtle earthiness without overpowering the beans and the onion/garlic punch will lend a sweetness. You may substitute other herbs like rosemary (but use less to avoid a soapy taste), sage or oregano. I will admit to stirring enthusiastically, with more frequency than necessary, to approximate the creamy texture of my childhood bean bowl, but the purist may stir gently and infrequently to maintain bean shape. Need I say that time will improve the flavor and texture of this soup? Flavor deepens and broth thickens, just as with any good soup or stew. Which makes this soup the perfect weekend project that will sustain you with love and comfort the whole week through. And since I am on a creamy kick, this soup meal would be perfect capped off with a scoop or two of smoky tea ice cream. Soak beans overnight (or at least eight hours) with water to cover. Drain beans, rinse well and set aside. Combine onion and olive oil in large 4 quart heavy saucepan or enamel cast iron pot and cook over medium heat until mixture begins to sizzle. Turn heat to medium low and cook, stirring occasionally, until onion softens and is translucent, about 10 minutes. While onion cooks, strip thyme leaves from their stems and combine with chopped garlic. Add garlic and thyme to softened onion and stir about 15 seconds until fragrant. Add beans and broth, and bring mixture to boil over high heat. Turn heat to low and simmer, stirring occasionally, until beans are tender to taste. Ideally, make up to five days ahead, cooling soup to room temperature before storage. To reheat, simmer gently on stovetop, adjusting seasoning as necessary, and serve hot topped with fresh parmesan shavings, amount determined by your preference. Oh my gosh! This turned out SO good! Thank you for a mag recipe! So very pleased you enjoyed it, Cheryl. Happy cooking! This looks great! Ummm, fiber good! I’m making some this weekend. Excellent plan, Joan. Let me know how it works for you and your family.Perfect for the cool nights of spring.